Enjoy all the amenities of home and discover what the island has to offer from this cozy cape. Only minutes from the heart of Oak Bluffs, Circuit Avenue offers everything from fine dining to entertainment for the whole family. Let our house be your home while you enjoy your stay on Martha's Vineyard. The Brewster House is more than meets the eye! This family-friendly home can comfortably accommodate large families! 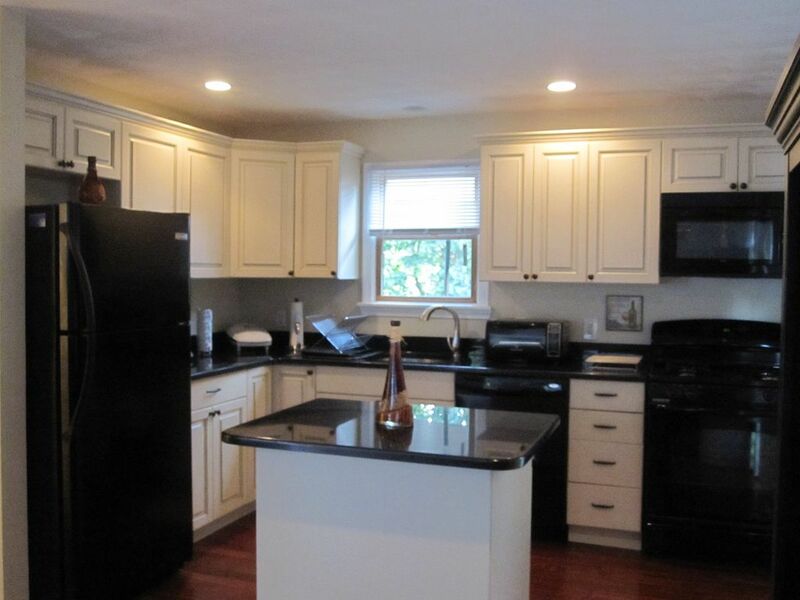 The property is within walking distance to downtown Oak Bluffs. The local bus stop is located across the street providing easy access to transportation. The basement is equipped with a video gaming room and family room. The Video gaming room has a full sized pull out sofa bed. The family room has two twin sized pull out ottomans. Hair dryer in each bathroom. There is a stand alone outside shower in the back of the house next to the deck. We've stayed here for several years now. The house is located close to everything which allows us to walk most places. The kitchen is modern and well equipped. The caretaker of the property is also very responsive. We love the house and stay year after year. This was a lovely property! It was very clean and well appointed. The amenities were above average, we had everything we needed to enjoy great a vacation and yet feel right at home. The location was perfect, a short walk to the pier, restaurants and shopping on Circuit Avenue. It was just enough exercise every day and several times some days to get to everything that was great about Oak Bluffs. I highly recommend this property to anyone looking for a nice, comfortable, complete and convenient place to stay. My family and I recently returned from a lovely vacation on Martha’s Vineyard (July 5-12). The property is located in Oak Bluffs. From the moment we unlocked the front door, we immediately felt at home. The home is beautifully decorated with charming details throughout. The kitchen area is amazing. It is well stocked with upscale accessories and all the comforts of home. As one reviewer mentioned, ‘nothing was spared.” This home is in both walking and biking distance to Circuit Ave, Inkwell Beach and all of downtown’s main attractions. We easily walked to town several times a day due to our close proximity. This location is ideal for those with or without a car. Additionally, it is a short walking distance to the bus. It is apparent from the moment you walk in that the homeowners thought of everything. There were flat screen TV’s which made it very convenient for viewing or utilizing the gaming systems provided. Each of the bedrooms were nicely decorated and comfortable and each had ample closet space including dressers. The family area located in the basement also provided additional seating areas which allowed for group activities as well as individual lounging. There is also a beautiful desk located downstairs that provided an additional elegance to the overall decor. One of our favorite places to relax was on the back deck which had comfortable seating and a fabulous grill (loved it) that made outdoor meals super easy to prepare. This area was extremely comfortable and we spent a great deal of time outside. The property also has a very large backyard that is ideal for a variety of activities. We were so impressed with the homeowner’s attention to details. The features this home provided definitely enhanced our stay at the Vineyard. Overall, I would highly recommend this property to those seeking a home that is both modern, charming and centrally located. I would certainly return to this property. We had an amazing vacation! My favorite summer week- 2011!! I got a chance to plan a week away this summer with three girlfriends and we decided to go to Martha’s Vineyard. I had never been and it was the best week of my summer. We picked this particular house because of the charm and location. Every morning I would go for a run along the beach, which started my day just right. Then we would either lay out on the beach or do some shopping. There are so many amazing stores of original and beautiful things it was hard to stop spending. The restaurants were great but my favorite was cooking at the house. We would have wine and cheese happy hours on the deck, over-the-top BBQ’s and then we would go into town for a bit of the nightlife. I can honestly say that I enjoyed every minute of that week even when we had to stay in because of a thunderstorm because we played fun games & watched movies in the entertainment room downstairs. The house had everything (I honestly didn’t want to leave) and having never been to Martha’s Vineyard I couldn’t have been happier with the entire experience. I’m looking forward to next summer because I will definitely be renting a week in this house (or 2) again!